Prepaid SIM Cards offer price and convenience, but issues arise when it comes time to configuring the settings. So many people nab an expensive airport Prepaid SIM card, only to encounter problems with an area lock, frequency, or network coverage. But with rental SIM Cards, you can rest assured knowing you'll have full support getting and staying connected. And if you have issues with the area or your phone compatibility, guaranteed refunds, no questions asked! You cannot make phone calls or use SMS with this SIM card. You can use VoIP apps such as Skype, WhatsApp, LINE, Viber and etc. to make a voice call. The connection speed will be reduced to 256Kbps once the data traffic volume exceed 350MB over a day (24 hour) period, however, it will be back to standard after 12:00am on the day the excess occurs. Reliable coverage provided by NTT DOCOMO with 100% population coverage. We will include a SIM Card Holder and a Slim SIM Card Tray Eject Needle Pin with the rental item. It will keep your SIM card safe while using our service. 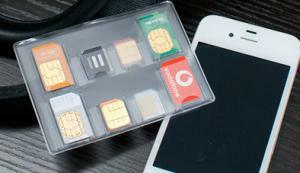 It will make it easy for you to exchange the SIM cards. If our SIM card were incompatible with your device, you can send it back to us within 2 days from the start date (the postmark date will be considered proof), then we will only charge you 840 yen (Shipping(540yen) + Handiling fee(300 yen)) and refund you the difference. Please test your device as soon as you receive our SIM card. If it were incompatible and you wish to get a refund, enclose the return slip we provide with the SIM card and return it to us, so that we know your device was not compatible. *We will not give a refund unless it is sent out within 2 days from the starting day.